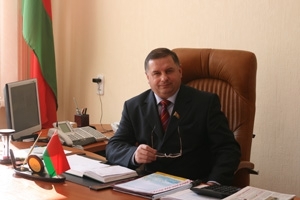 Leadership - Agricultural complex "Zhdanovichi"
Since 1998, the agricultural complex directs Grigoriy Petrovich Chuiko who inherited from his predecessors the rich experience in agricultural management and inserted his own principles. Today the enterprise focuses on new technologies and expansion of production. "Nowadays providing the country's population with food resourses is considered to be the State's primary objective, as this is closely connected with maintaining the State's ration security. Moreover it is not only necessary to fill the market with cheap and accessible foodstuffs, but also to make them healthy for the benefit of those who may buy them at the market or in shops. That is why the management of production quality is the main development strategy of the agricultural complex "Zhdanovivhy" and the big team of the complex is constantly working on expanding the range of goods snd improving their consumer qualities. Apart from this, the enterprise focuses on increasing the welfare of its imployees. We aspire to make the "Agricultural complex "Zhdanovichy" an exempary modern enterprise not only at the food supply market, but also in terms of working and living conditions of our employees."